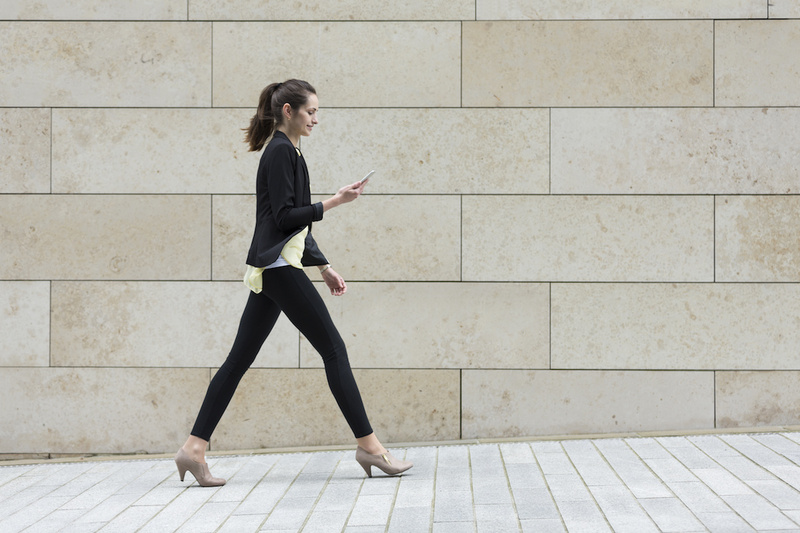 It’s an all-too-familiar scene: someone walks hurriedly beside you on the sidewalk, staring at their phone; meanwhile, it’s up to everyone else to dodge the haphazard, distracted walker to avoid a collision. The average American spends nearly five hours a day looking down at his or her phone, and the majority of this time is also spent doing other things – eating, walking and exercising. While the phone-addicted multi-tasker may seem annoying to the average person, marketers are increasingly finding an opportunity to meet the downward gaze of these consumers. Floor decals and graphics are not the newest marketing product on the market, but they’re now more relevant than ever – especially as it’s become standard for consumers’ line of vision to be pointed directly at the floor. As with storefront windows and walls, floor space is a free marketing platform. It’s already in place, paid for and ready to be the canvas for your latest marketing campaign. Not only are floor decals cost-effective, considering you’re using a resource you already own, they’re also the perfect opportunity to maximize your space. Instead of cluttering valuable wall space with posters, you’re able to market to your consumers in an easy, non-intrusive way that also saves you space. Floor graphics can be cut into almost any size or shape, making them incredibly versatile. You can also apply custom printed graphics to almost any surface – wood, tile, carpets and asphalt or concrete – so floor decal marketing works in any environment. Laminated with slip-resistant coating, floor graphics are a strong, risk-free, unobstructed marketing tool. In fact, a 2014 study from the International Journal of Business and Management Invention found that floor ads were directly linked to 30 percent of sales. Floor graphics are also inexpensive enough to use for short-term promotions, while being durable enough to use as long-term signage. Whatever your needs and environment, floor graphics and decals are an effective way to steer customer flow, support your theme, strengthen your brand affinity, and quite simply, grab the attention of smartphone-addicted shoe gazers. Beyond aligning with consumers’ tech habits, floor graphics are novel enough to make an impact on customers of all walks. Traditional run-of-the-mill marketing tactics have become easier for consumers to ignore. However, floor graphics cut through the clutter and grab your customers’ attention right away. Since they’re still used sparingly by most businesses, floor graphics are a relatively novel marketing tactic – creating a more impactful, memorable impression on everyone who sees them. Although retailers are some of the most avid floor graphics users, there are plenty of uses for businesses and events of all kinds. From wedding parties and museum exhibits to corporate office décor, there are many ways you can use floor decals to enhance brand awareness or simply add an interesting design component to your space. Your local SpeedPro team can create a customized floor graphics and decal solution for your business, providing you a unique, cost-effective marketing and branding opportunity. Find a studio near you.